db’s resident foodie, Lucy Shaw, heads to the new Covent Garden opening from the duo behind The Palomar in the hope of a similarly spectacular dining experience. The concept: When The Palomar opened in Soho in 2014, the tiny restaurant specialising in Jerusalem sharing plates soon shot to fame for its vibrant dishes and electric atmosphere, particularly up at the bar where the chefs play the pots and pans and hand out shots to diners lucky enough to secure a bar stool. 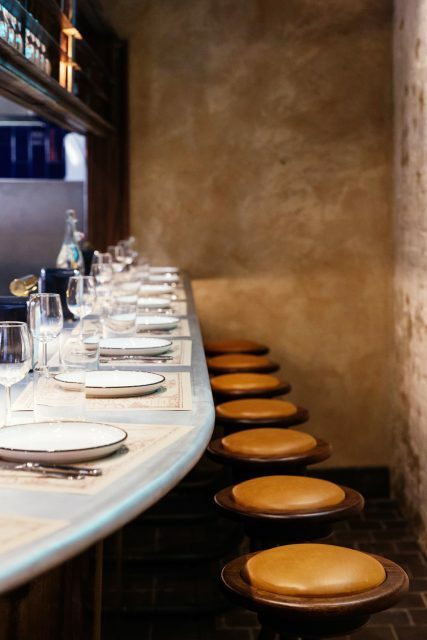 When news broke earlier this year that brother and sister Layo and Zoe Paskin were to open a second site in Covent Garden, appetites were whetted and expectations were high. This time around inspiration comes from the Barbary Coast in North Africa, encompassing Morocco, Algeria, Tunisia and Libya. The décor: With the bar proving so popular at The Palomar, Layo and Zoe have done away with tables all together, focusing the action instead around a curved bar à la Barrafina, giving everyone a front row seat to the action. The colour scheme is earthy, from the tan stools to the polished mahogany bar, reflecting the colours in the Atlas Mountains where the Berbers settled in the 16th century. Each place setting features an ancient illustrated map of the Barbary Coast. The food: In keeping with a growing trend in London to strip cooking back to basics, meat, fish and veg are grilled over an open flame in a hat tip to the simplicity of Berber cuisine. Like The Palomar, the dishes pack a punch, assaulting the senses in the most delightful way with a kaleidoscope of flavours. The menu is divided into five sections: baking & grinding, earth, land, sea and heaven. All of the dishes are designed to be shared, and the majority are so good you’ll want to order everything, particularly when it’s easy to eye up what your neighbour’s eating. Among the many highlights were the Jerusalem bagel – a hunk of a thing crowded with sesame seeds, its fluffy white interior perfect for dipping into smoky, silky, pine nut-flecked baba ghanoush and fiery harissa. Another must is the meaty monkfish chermoula, doused in herbs, spices, garlic and lemon, served with a dollop of creamy yoghurt and topped with coriander. Signature dish: For carnivores, the pata negra neck is unmissable. Flecked with salt and cooked medium-rare, the meat bears the smoky char from being cooked over coal, but its interior is juicy and impossibly tender, and made all the more magnificent with the addition of a divine sweet sauce involving date honey. The drinks: Diners are encouraged to begin with an apéritif, from a vermouth and tonic to a Fernet Branca and ginger beer, then move on to sample some of the wines by the glass, including drops from Lebanon and Israel. Among the highlights was a zippy Albariño from Rías Baixas and a rich, mineral Jacquère from Savoie. On the red front, a blend of Trincadeira, Arragonez and Alicante Bouschet from wine writer Richard Mayson’s Alentejo project Sonho Lusitano is ripe, rugged and rustic, delivering powerful black fruit flavours. Who to know: Restaurant manager Tulisa Lawrence, who will do her best to secure you a bar stool without a long wait. 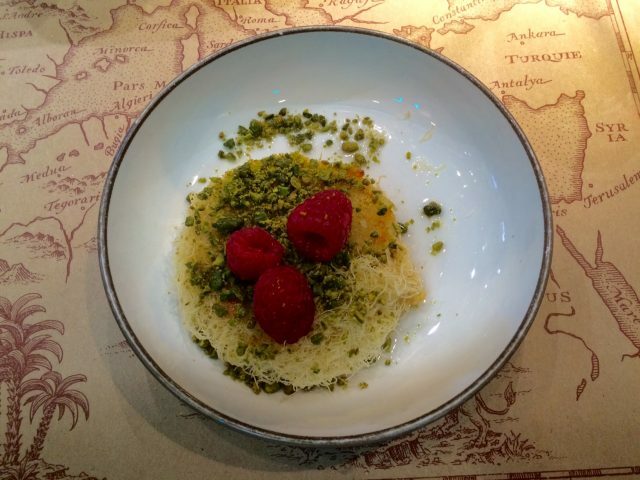 Don’t leave without: Ordering the knafeh for dessert. Similar to baklava, beneath a syrupy bird’s nest topped with chopped pistachios and raspberries lies a layer of gooey goat’s cheese and mozzarella in a sweet-savoury combo that will rock your world. 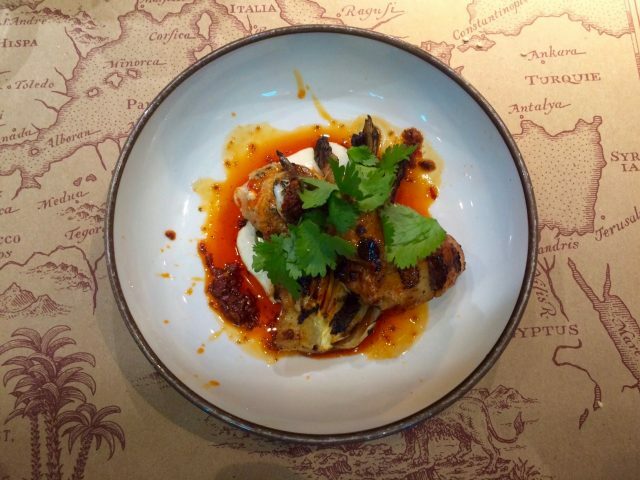 Last word: The Barbary is one of the most exciting London restaurant openings of the year and is well worth the queues. The Palomar team have done it again with stylistic swagger.